ExRx.net Downloadable Offline Version includes the same content as on the website, ExRx.net. All you need to use ExRx.net on Downloadable Offline Version is a computer and a web browser (preinstalled on most modern computers). An online connection is optional and is only required to follow external links to other sites, viewing high resolution video, and for purchasing ExRx products or service on the web. ExRx.net Downloadable Offline Version includes over 3000 pages of exercise information, fitness calculators, and nearly 1800 animated exercises cross-referenced by joint articulation and muscle movement (See Exercise & Muscle Directory). ExRx.net Downloadable Offline Version does not include components not actually on our site such as the Vimeo Exercise videos, ExRx Online Forum, Streaming Audio Interviews, Site Language Translator, Google Search, and the Currency Converter. With the exception of the Vimeo exercise videos, these components are still available with an online connection to the internet. The Downloadable Offline Version however, shows the animated GIFs (not the corresponding Vimeo video) and can be searched for word or phrase occurrences using your computers operating system (Windows, Mac OS, etc.). Use ExRx.net content on a laptop or desktop computer without an internet connection. View pages much faster than using internet connection..
All copyrights on ExRx.net content apply and will be enforced. Purchasing and/or using ExRx.net Downloadable Offline Version constitutes acceptance of the Licensing Agreement (below). Upgrades are available at a nominal fee for future updates. 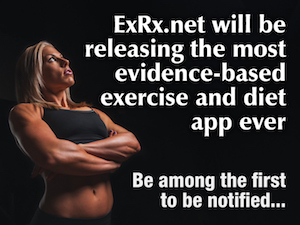 ExRx.net Downloadable Offline Version is a resource for the exercise professional, coach, or fitness enthusiast. Physical activity and exercise have the potential for serious injury. The information contained on the ExRx.net Downloadable Offline Version is not intended as a personal prescription. It is recommended to see a physician before starting an exercise program. The creators and associates of this site will not take responsibility for any and all injuries related to the information contained or referenced within this Downloadable Offline Version. By purchasing or using ExRx.net Downloadable Offline Version you are agreeing to the included licensing terms and conditions. The contents of ExRx.net Downloadable Offline Version is not freeware and may not be legally obtainable from any other source than ExRx unless expressly allowed by ExRx. This license is effective until it is terminated. You may terminate it at any time by destroying the Downloadable Offline Version and its content together with any copies currently in your possession. The License also terminates automatically and without notice if you fail to comply with the terms and conditions of this Agreement, and additionally you need to destroy any copies or variations of the content on the Downloadable Offline Version. a purchase of an ExRx Downloadable Offline Version is a license to use ExRx content off-line; to be used by one individual or to be copied on a single computer. All copyrights on ExRx content apply and will be enforced. ExRx makes no representations about the outcome or benefits resulting from the use of the contents of the ExRx Downloadable Offline Version. you may not reverse engineer, decompile, disassemble or otherwise reduce the contents of the exrx cd-rom to any human perceivable form. you may not modify, adapt, translate, rent, lease, loan or create derivative works based upon the contents of the exrx cd-rom or any part thereof. if the contents of the ExRx Downloadable Offline Version is supplied to the United States Government, the contents of the ExRx Downloadable Offline Version is classified as restricted computer software as defined in clause 52.227-19 of the FAR. The United States Government's rights to the contents of the ExRx Downloadable Offline Version are as provided in clause 52.227-19 of the FAR. you agree to consult your physician before using the contents of the ExRx Downloadable Offline Version to alter your normal eating, exercise, or wellness program. this license agreement may be modified by ExRx.net, LLC at any time. ExRx.net, LLC expressly disclaim any warranties for the contents of the ExRx Downloadable Offline Version. The contents of the ExRx Downloadable Offline Version is provided "as is" without warranty of any kind, either express or implied, including, without limitation, the implied warranties or merchantability, fitness for a particular purpose, or non-infringement. The entire risk arising out of use, or performance of the contents of the ExRx Downloadable Offline Version remains with you. In no event shall ExRx.net or their suppliers be liable for any damages whatsoever (including, without limitation, damages for loss of business profits, business interruption, loss of business information, or any other pecuniary loss) arising out of the use of or inability to use this Downloadable Offline Version or its contents, even if ExRx.net have been advised of the possibility of such damages. The contents of the ExRx Downloadable Offline Version is owned by ExRx.net, LLC and is protected by United States copyright laws and international treaty provisions. You may not remove the copyright notice from any copy of the contents of the ExRx Downloadable Offline Version or any copy of the written materials, resulting form the use of the contents of the ExRx Downloadable Offline Version. The terms stated in this Software Licensing Agreement are a portion of a larger Agreement entitled Terms and Conditions of Use for the ExRx internet presence. This subsection IS NOT a separate agreement. All of the rules stated in the document of which this subsection is a part of apply to the usage of the contents of the ExRx Downloadable Offline Version. It opens just fine with Internet Explorer. This is too cool, I love it. Thank you so much ExRx. I am a physical therapist and athletic traininer in Ontario Canada. I run rehab and training practice and I use your site and CD everyday. Very well done, detailed and thorough site.